From the looks of it there’s going to be an inclusive government for Goa at least for the time being. It’s a case of one chief minister, the BJP’s Pramod Sawant (and late Chief Minister Manohar Parrikar’s blue-eyed boy) and two really heavyweight deputy chief ministers — senior veteran politician Ramakrishna Sudin Dhavalikar (MGP) and Vijai Sardesai (Goa Forward party) for Goa. For those familiar with Goan political history it may be a disquieting moment with nobody quite sure how it happened. All kinds of rumours were afloat even before Manohar Parrikar breathed his last on March 17, 2019 (actually St Patricks Day for Catholic Goa). Then came the crucial floor test at the Goa Assembly on March 20, 2019, and what do you know, the BJP won with a margin of 20-15 and Pramod Sawant stays as chief minister. Few were surprised and many suffered from déjà vu. But the good news is that on the surface at least it’s all green signals for new Chief Minister Pramod Sawant, who may be a young chief minister in his mid-40s but is no newcomer to politics having grown his political wings by the side of his mentor Manohar Parrikar. 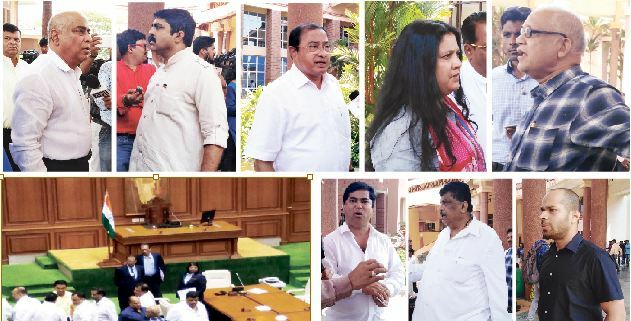 The key question which arises is will Goa’s new chief minister be able to keep both his deputy chief ministers happy and on his side and for how long? Pramod Sawant presented a picture of restrained emotional upheaval as also poignant dignity in the house with his short straight-to-the-point speech appealing for an inclusive government for Goa so that his mentor’s unfinished works of development could be completed. He humbly said he was no tall leader like Manohar Parrikar but he would like everybody to work like a team. He said he had learned a lot of positive things with his late mentor and hoped to maintain this positivity as chief minister. The floor test was conducted after various MLAs paid long and handsome tributes to Manohar Parrikar’s vision of a Goa developing along modern lines with bridges and highways and lots of schemes to ameliorate the woes of aam aadmi and aurat. The 14 Congress legislators voted against the motion of confidence tabled by Chief Minister Pramod Sawant and they were supported by the only Nationalist Congress Party MLA Churchil Alemao who had earlier showered profuse praise on Manohar Parrikar. He was a chief minister who was everybody’s darling! It is clear for the time being at least no one wants to upset the apple cart. Never has the Goa Legislative Assembly seen such a thought-provoking day against the backdrop scenario of three politicians passing away soon as illness took its toll one after another — beginning with Vishnu Surya Wagh (former deputy speaker), then Francis D’Souza (former deputy chief minister) and lastly Manohar Parrikar (chief minister of Goa for over two decades). Nobody was expecting him to go so early in his pancreatic disease, most thought he would endure and Goan politics would continue to maintain the status quo like a happy family. Needless to say Parrikar is popularly seen as Goa’s first highly educated chief minister, an IIT-ian, the tallest “man of vision” with his long-standing chief ministership (including his stint as Defence Minister of India courtesy a generous Prime Minister Narendra Modi). His school friend Francis D’Souza, former deputy chief minister of Goa and MLA of many years, was always the loyal face of Catholic Goa in government and who can forget his description of himself as a “Hindu Catholic!” Vishnu Wagh is remembered as a stirring orator, distinguished writer, a poet who deserved better from Goa’s perennially in power sooty Brahmin samaj! Acting Deputy Speaker Michael Lobo who conducted the proceedings of the house, in his winding up reiterated that three departed leaders of the Bharatiya Janata party will be missed in the Assembly, remembered for their contribution towards Goa’s growth. As a mark of respect for them a samadhi is coming up Miramar beach for Manohar Parrikar, while a new bus stop in Mapusa is to be named after Francis D’souza’s. An art gallery devoted to Vishnu Wagh’s works is also on the cards at the Kala Academy. All in all politics has its moments and this time around it was the lost looking figure of Pandurang Madkaikar (post stroke episode) who sat and stood up as instructed by house marshalls, he presented a picture so powerful in its political connotation that it remained in memory long after — even as everyone in the house flocked around him for a photo op after the vote of confidence. Previous post: A LONG, LONG QUEUE TO SAY ADIEU TO MANU!